Conference “Challenge without Response: Hate Crimes against LGBT People in Ukraine” organized by LGBT Human Rights Nash Mir Center and the Ukrainian Helsinki Human Rights Union was held in Kyiv on February 23. The conference was attended by over 150 lawyers, human rights defenders, LGBT activists, employees of the National Police of Ukraine, representatives of other public and governmental organizations, diplomats, and politicians. Welcoming speeches to the participants of the event were made by UHHRU Executive Director Oleksandr Pavlichenko, General Rapporteur for the Rights of LGBTI people of the PACE Piet de Bruyn, a representative of the Ukrainian Ombudsman Aksana Filipishyna, a member of the Ukrainian Parliament Svetlana Zalishchuk, representatives of the British and Canadian embassies as well as, through a video message, by the Council of Europe Commissioner for Human Rights Nils Muižnieks. The conference was long and hopefully fruitful. All participants emphasized the obvious urgency of strengthening the fight against hate crimes against the background of a sharp rise in aggressive homophobic attacks on LGBT events, organizations and individual activists in Ukraine in recent years. They discussed, in particular, the practical problems faced by investigators and judges in investigating hate crimes against LGBT people – in our opinion, it was very important that the conference was attended by representatives of the investigative offices from all regions of Ukraine as well as lawyers who face these issues directly into their daily work. Nash Mir Center presented the draft law that we have developed to make necessary changes to the Criminal Code of Ukraine, which fully complies with the relevant provisions of the Action Plan on human rights and which was to be developed by the Ministry of Internal Affairs and submitted to the Cabinet of Ministers more than a year ago. From Vladislav Burlaka, a representative of the Chief Investigation Department of the Ministry of Interior, we learned with interest that this agency has finally also developed its own version of the bill to implement the Action Plan, and it is now submitted for legal examination to the relevant department of the Ministry. However, Mr. Burlaka did not share details of the document with us. In any case, Nash Mir Center and the UHHRU hope to cooperate with the Interior Ministry on the development and adoption of this very necessary for our country’s law and that our proposals and criticism to this document will be considered in the final variant. The main achievement of the conference, in our opinion, is that it has demonstrated the presence of a political will of the Ukrainian government to address hate crimes on a number of grounds, including sexual orientation and gender identity and outlined the main allies of the Ukrainian LGBT movement in addressing this question: the Department for human rights monitoring of the Interior Ministry, the Parliament Commissioner for Human Rights, Ukrainian human rights organizations, foreign and international partners of Ukraine. Also very important is the introduction of this problem as well as the Ukrainian LGBT community in general to such a wide range of representatives of police structures, especially of investigative departments, because to change the situation in this area is only possible through the joint efforts and cooperation between our community and our police. We are inspired by the example of Canada – a country that was built with the substantial participation of Ukrainian immigrants and which successfully solved the problems currently facing our country. 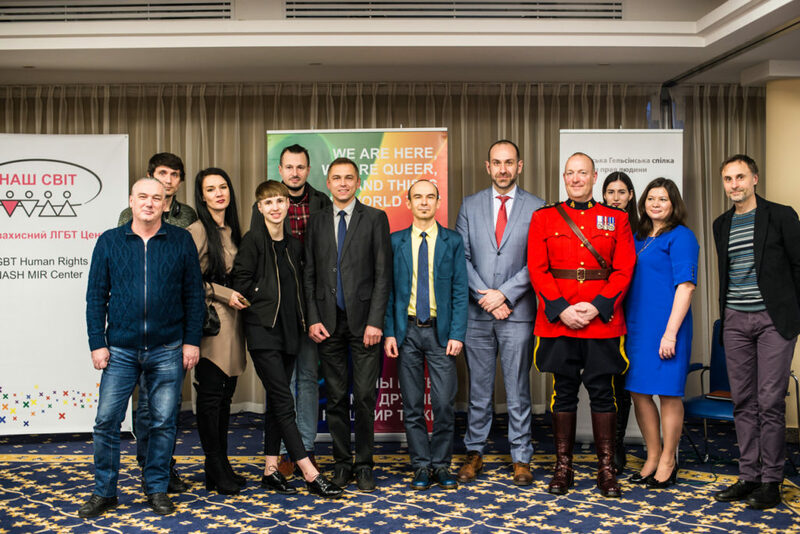 Bruce Kirkpatrick, a Chief Superintendent of the Royal Canadian Mounted Police and the head of the Canadian Police Mission to Ukraine, told us about this experience and assured to provide any assistance on their part in reforming the Ukrainian police. We hope that our police carry their uniforms with the same pride and dignity, which are their famous red uniforms Canadian Mounted Police; Chief Superintendent of the Royal Canadian Mounted Police and the head of the mission contingent of Canadian police in Ukraine, told us about this experience and assured us in providing any assistance on their part in reforming the Ukrainian police. We hope that our police will carry their uniforms with the same pride and dignity as Canadian Mounted Police officers wear their famous red uniforms! The conference also adopted appeal to the Ukrainian authorities. The conference was organized with support of the British Embassy in Ukraine, Canadian Fund for Local Initiatives and Tides Foundation (USA).